Iran's new president, Hasan Rouhani, has accused the United States of seeking an excuse to confront the Islamic republic over its nuclear program. The newly sworn in leader reportedly made the claim during a meeting with North Korean official Kim Yong Nam, who came to Tehran for Rouhani's inauguration. Rouhani, who was elected in June, has promised greater openness over the country's nuclear activities. However, he is subordinate in the country's power structure to the clerical leadership, particularly in the realms of foreign policy and security. At his inauguration earlier today, the new president was formally endorsed by Iran's supreme leader Ayatollah Ali Khamenei. The Mail Online said that at his inauguration, Rouhani pledged to follow a path of moderation and work to get Western sanctions over Iran's suspect nuclear program lifted. “The government's (goal) will be to tackle people's living issues. ... In parallel, it will take new steps in the arena of international relations to improve Iran's standing on the basis of meeting national interests and remove the current oppressive sanctions,” Rouhani said. According to the official IRNA news agency, Rouhani has also made his first appointment, choosing Mohammad Nahavandian, a 58-year-old businessman with a doctorate in economics from George Washington University in Washington, as his chief of staff. But Rouhani's talk of "moderation" jars with a statement made two days earlier, in which he called signaled his intent to toe the extreme anti-Israel line of his predecessor, calling Israel an "old wound" that "should be removed." Israeli Prime Minister has warned western leaders against letting their guard down, branding Rouhani a "wolf in sheep's clothing." 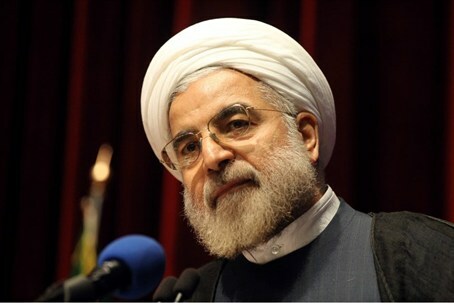 Indeed, in a recent speech directed towards the president-elect, top Iranian cleric Ahmad Khatami, a close confidante of Iranian Supreme Ruler Ali Khamenei, warned the president-elect that his authority relies on his fealty to the Supreme Leader, and that “anyone taking a position opposing that of the leader of the Islamic society [i.e. Khamenei] must expect consequences and the results from the nation." “The rule of the jurisprudent is the standard of the nation in the regime of the Islamic Republic," he continued, "and none – not even the president – is entitled to take a position against it..."
“As the leader [Khamenei] instructed, we are assisting any Palestinian group that wants to fight the Zionist regime,” he added, claiming that the Iranian leadership was very pleased at how Iran played a role during Operation Pillar of Defense, during which Hamas hammered Israeli civilian centres with rockets and missiles. “The nation's motto is always: 'We are all your soldiers, Khamenei, we are attentive to your instructions, Khamenei,'” Khatami declared.